Admiral Husband E. Kimmel (Martin Balsam) stares in speechless awe at the destruction of Pearl Harbor caused by invading Japanese forces. A bullet flies up and hits him in the chest, and he fails to even move to defend himself from danger. Much of the blame for this military disaster falls on Kimmel's shoulders, and he just cannot believe what has occurred on American soil. Luckily, the bullet is already spent, but he replies that it "would have been merciful had it killed me." These comments show the complete and utter shock by many officers at the surprise Japanese attack and its ramifications for the country's future. Tora! Tora! Tora! covers the time before and during the attack on Pearl Harbor from the unique perspective of both sides of the historical event. Separate film crews shot the scenes within, re-enacting the actions of each country's armed forces. The two portions were edited together for a film that provides a complete and unbiased view of Pearl Harbor. While the Japanese prepare for an extremely courageous surprise move, the Americans attempt to speculate (mostly incorrectly) about the next action by Japan. The climax is an extremely intricate and impressive attack sequence that provides a clear picture of the events of the fateful day of December 7, 1941. With the recent arrival of Pearl Harbor - Michael Bay and Jerry Bruckenheimer's new big-budget epic - now is a perfect time to discover a film that really tells a historical version of the attack. Tora! Tora! Tora! doesn't bother with a fictional love story to draw in teenage girls, and instead does the day justice with startling accuracy. This film contains a talented collection of older (and mostly unrecognizable) character actors and avoids using young stars to bring financial success. And while the budget fails to come close to 135 million dollars, the action is heart wrenching and well done. I have not seen the new film (and don't plan to), but it seems fairly clear the focal point is not a complete and accurate historical recreation of the events. Any movie that virtually ignores the Japanese side of the attack is missing much of the essential elements in telling any story about Pearl Harbor. Although this film covers both sides of Pearl Harbor, it would seem that its American studio would influence it to cast them in a more favorable light. Nothing could be further from the truth. In fact, the true protagonists of this movie are the Japanese soldiers preparing for battle. Led by Admiral Isoroku Yamamoto (Soh Yamamura), they devise an ingenious plan to silently travel towards Hawaii and severely cripple the United States Navy. It's especially notable that these characters speak Japanese (with subtitles), and no pandering exists to make things easier for American audiences. Led by charismatic Lt. Commander Mitsuo Fuchida (Takahiro Tamura), they perform their duties with amazing precision. And while they fail to achieve their ultimate goal, the attack works nearly as well as possible. On the other side of the ocean are the clumsy American soldiers, who continually underestimate their opponents and their resolve. During the events immediately preceding the attack, their actions nearly resemble slapstick comedy as they bungle any chances for defense at every possible moment. Lt. General Walter C. Short (Jason Robards) comes off especially poorly as an arrogant man who fails to see beyond the straight and narrow path. Not much better is Kimmel, a demure "yes" man who won't make the mistakes of his predecessor and question his superiors. The sad fact is that these American errors did actually happen. The Japanese pulled the blinds in front of our eyes, and the results were tragic and unfortunate. 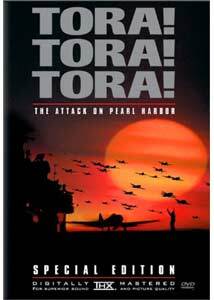 The Pearl Harbor attack definitely serves as the highlight of Tora! Tora! Tora! with its incredible action sequences and amazing stunt work. Created long before the days of CGI effects, these shots required impeccable timing in order to ensure safety for the cast and crew. Although the film drags slightly in its first half, any dull moments are erased from memory during the lengthy climax to this story. Far from just a series of explosions and gun shots, the Pearl Harbor attack features quick looks at valor and courage within the destructive chaos of this tragic day. Image Transfer Review: This 2.35:1 anamorphic widescreen transfer matches the one included with the original DVD release of the film in November of 1999. This picture sports an excellent level of clarity and brightness for the most part, but certain scenes are extremely grainy and dark. At certain points of the film (especially during the daytime flight scenes), the transfer works wonderfully and really displays the effects of the immense restoration necessary from the original print. Unfortunately, the uneven nature of the images keeps it from becoming a top-level transfer. Audio Transfer Review: This disc includes a THX-certified 4.1-channel Dolby Digital track that features impressive sound during the entire presentation. This transfer works especially well during the Pearl Harbor attack, where gun shots, explosions, and plane engines echo from all sides of the transfer. With the powerful score resounding through the sound field and the Japanese planes preparing to strike, the sounds nicely create the perfect atmosphere. While the rear speakers aren't utilized as fully as the best DVD audio tracks, they still assist in creating an enjoyable experience. The Dolby Surround track works decently, but it is a major step down from the 4.1-channel transfer. I compared several scenes on each track, and the differences appeared larger than normal. The French mono transfer is fine, but it fails to include dubbing on the Japanese side of the story. Extras Review: Tora! Tora! Tora! contains two impressive bonus features that were not included in its original DVD release. The first is an extremely informative feature-length commentary from American director Richard Fleischer (Dr. Doolittle, Fantastic Voyage) and Japanese film historian Stewart Galbraith. While both speakers are fairly dry and straightforward, this track provides plenty of background into the production and actors in this film. Galbraith spends most of the time serving as the interviewer and asking a variety of questions of Fleischer. His knowledge of Japanese films is immense, and he gives an impressive amount of information into the actors showcased in this film. The most interesting section concerns Akira Kurosawa and how he originally was the Japanese director. Fleischer is very straightforward and explains why the immensely talented director didn't mesh with this production. The commentary also covers various problems that occurred during the production, including the difficulty in acquiring American aircraft and creating the monster sets for the battleships. The second supplement is Day of Infamy - a new, 20-minute documentary about the historical facts of Pearl Harbor and its relation to the film. It features a variety of expert speakers, including Paul Stillwell, the director of the history division of the U.S. Naval Institute. World War II buffs will love the way the events prior to the attack are dissected to simply explain why it occurred. This documentary utilizes shots from the film, as well as old, black-and-white footage of the naval officers and vehicles. It's interesting to note the uncanny resemblance between the actors and their real-life counterparts. This feature also clearly covers the controversy of whether Franklin D. Roosevelt knew about the attack beforehand. It's a touchy subject, but it looks at all sides of the issue nicely. This disc also contains the original theatrical trailer and a THX Optimode section for testing your audio system. The trailer comes in a full-frame, grainy transfer with quiet sound that really shows the improvement made on the picture for this DVD release. An extremely ambitious project, Tora! Tora! Tora! hits perfectly on nearly all cylinders and presents an impressive re-creation of the Pearl Harbor disaster. Succeeding both as a dramatic film and as a historical document, this film presents an amazing story of startling precision and bumbling ineptitude. By covering both sides of the issue equally, viewers are given a complete picture of what could be a one-sided event. While it moves slowly in its early information-packed stages, the events keep moving and culminate with a wonderfully staged finale. The day remains tragic and saddening, but it becomes more understandable through this eye-opening film.